it is a bombproof old-school simple design, by design. -stash-it/stow-able, as a summit pack. Sure. I only lurk on MP, so send them this way or have them email me directly. 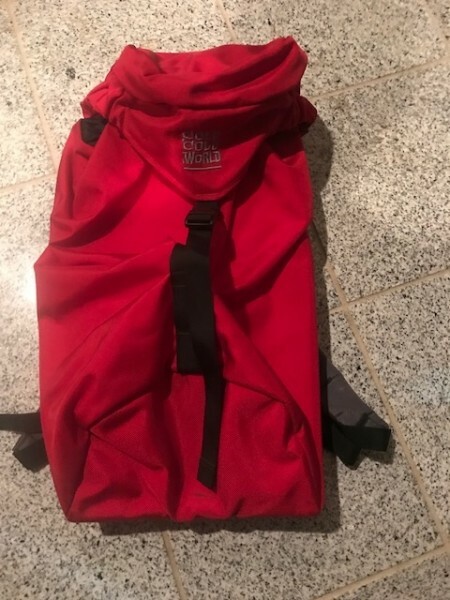 It really is a fantastic crag pack, and as you say it will last a lifetime. Yes it is a great build of a great old design, nearest thing to a FROG, out there. & if nothing comes of it, at least It more eyes see it. wish I could justify it. Sold. Thanks Gnome for posting it on MP. Looks like Laralyn Mowers doesn't understand what a crag pack is for. Top loading only is a deal breaker? WTF? cross loading the stitching on the bag, its a great pack too. has been my climbing bag. When I look at the 6 Ive got they are all similar..
um oh//Says the CCW Ozone is sold, ???? Still available tomorrow I'll take it... not that I don't get how quality it is, just trying to be less impulsive. hey now, are you talking About the Ozone or the Andinista? Damned good pack for the alpine. The CCW Ozone is strictly a crag pack. For more features like tool loops, daisy chains, etc., the CCW Valdez is incredible. I love the CCW Chaos, especially with heavy loads. Versatile and well designed. Damned good pack for the alpine." I'm not sure but I think Norm Is still selling his. They don't make or continue making the best designs because we all hold & Use them for 30 years. The current trend is to sell trendy crap that wears out in one season of regular use. They even make fake haul bag style sacks that have zippers but no 'Lid', or usable top pocket. That they add mesh side pockets to, with ribbons where you need burly straps. Got a chernobyl I love for BC skiing. Just ordered another valdez; gave my old one to a friend. Randy is currently in production of the valdez in red and black (his standard color is blue). Iffnn ya want one, now is a good time to order; damn good pack for a reasonable price considering the quality and he makes them himself in NH. I was never sure why it was named the Chernobyl, but mine is still going strong after probably 30 years. I guess the deal is, your CCW Chernobyl won't wear out until its namesake is inhabitable again. Fantastic pack. Design is exactly right, carries really well skiing or alpine climbing, holds exactly the right amount for a minimalist couple of day alpine outing, incredibly durable. I guess the deal is, your CCW Chernobyl won't wear out until its namesake is inhabitable again. That is FUNNY! And may be right. Saw an episode of Anthony Bourdain went he went to Russia and visited Chernobyl. The plant life was doing well. Just shows that when mankind becomes extinct the world will still be here. so I think there are deals to be had. then, I would have Randy replace/fix it. Sad to say I'm not going to be able to buy it.